"This is a delicious, easy side!" Preheat an oven to 400 degrees F (200 degrees C). Place the potatoes into a mixing bowl, and drizzle with olive oil. Sprinkle with kosher salt, black pepper, Parmesan cheese, and thyme leaves. Toss to evenly coat, and transfer to a 9x13-inch baking dish. 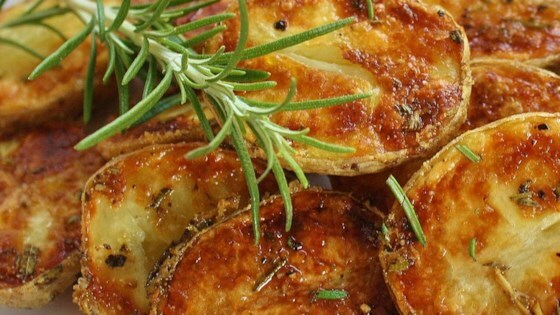 Bake in the preheated oven until the potatoes are golden brown on the edges and tender when pierced with a fork, about 1 hour. Serve hot or at room temperature. It was a little salty for my taste but my husband loved them!!! It really reminded me of italian flavor so next time i will add some fresh minced garlic. Excellent recipe and very easy to make! My kids love the parmesan in this - I've made this several times and it's great. Just make sure you use plenty of non-stick spray. Very easy to make. The potatoes were incredibly salty though, I definitely wouldn't add as much salt next time!